Twisted gastrulation (TSG) is a secreted, cysteine-rich protein that plays a role in dorsal/ventral patterning in Drosophila and Xenopus by regulating BMP signaling. TSG was originally identified in Drosophila melanogaster and shown to be required for the differentiation of the dorsal amnioserosa cells. Studies of expression and function of Twisted Gastrulation have been performed in Drosophila and Xenopus. Xenopus TSG is expressed in the ventral regions of the embryo during gastrulation, mimicking the BMP-4 expression pattern. TSG is expressed in dorsal cells of the blastoderm embryo, where there are also high levels of activity of Dpp and Screw. Vertebrate TSGs were subsequently cloned in mouse, human, zebrafish and frog. TSG acts as an agonist for BMP signaling by modulating the inhibitory actions of the BMP antagonist, Chordin/Sog, and the cleavage properties of the metalloprotease, xolloid/tolloid. 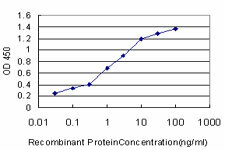 The N-terminal domain of TSG can bind BMP protein directly in vitro and shows BMP antagonist activity. Western Blot analysis of TWSG1 expression in transfected 293T cell line by TWSG1 monoclonal antibody (M01), clone 6E6.Lane 1: TWSG1 transfected lysate(25 KDa).Lane 2: Non-transfected lysate. Detection limit for recombinant GST tagged TWSG1 is approximately 0.1ng/ml as a capture antibody. TWSG1 monoclonal antibody (M07), clone 2F3. Western Blot analysis of TWSG1 expression in human kidney.